The 2014 Giro d’Italia, May 10 to June 1, is coming into focus: A Belfast start, a 46.4-kilometre time trial in Barolo, a climb to Zoncolan and a finish in Trieste. In Las Vegas overnight, organiser RCS Sport presented the time trial with rumours already circulating about a Belfast team time trial, and climbs to Oropa and Plan de Corones. The Giro’s menu includes much more. RCS Sport announced in February that Belfast will kick off the race. It revealed on Friday that Trieste would host the final stage and that the riders would climb to Zoncolan the day before. It will tie the entire 2014 route together at the official presentation in Milan on October 7. The Milan appointment is not preventing local organisers from speaking. Tutto Sport newspaper, a rival to RCS Sport’s La Gazzetta dello Sport, reported yesterday that the Giro would return to Plan de Corones the day before Monte Zoncolan, May 30. And just like its last visit in 2010, it plans a 12.9-kilometre time trial from San Vigilio di Marebbe to the ski station. The road angles up to 23.5% and becomes gravel at the top. Val Martello will debut finally, according to Tutto Sport. Snow forced the organiser to cancel the stage this year. Gavia and Stelvio again feature on the Giro’s menu before Martello. The weekend before, May 24 and 25, the race is due to climb to the Santuario di Oropa and Montecampione. The first week remains a mystery. Tutto Sport, however, wrote that the race would kick off with a team time trial in Belfast. Local organiser Darach McQuaid would not confirm the news to Cycling Weekly. What is official is that Giro will stay in Belfast for two days and run from Armagh to Dublin on the third day. 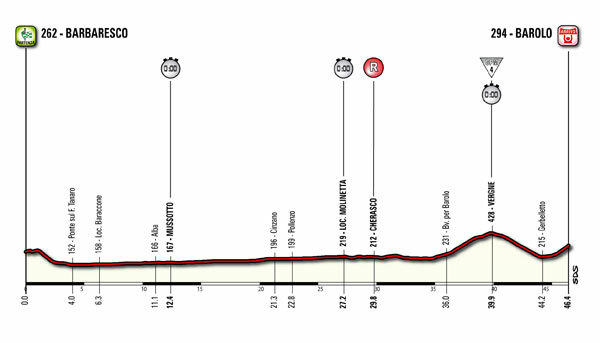 Due to UCI regulations that forbid a rest until the sixth day, the race will continue in Italy on May 13. The race is rumoured to travel from Bari, in the country’s heel, through Umbria, Emilia-Romagna and Tuscany before reaching Piedmont’s wine country.